I just released Render Presets, another free plugin for LightWave 3D, which lets you manage a library of common rendering related settings to quickly organize, apply or switch between them. This started out as a script I wrote a long time ago when I worked with a project where I constantly needed to change between different Global Illumination settings, so to keep my sanity I whipped up a script to quickly switch them on the fly. I continued to find it useful and over time I’ve included additional settings that I’ve had use for. I finally decided to clean up the user interface to be more generic and add more of LightWave’s common render settings so I could release it in public. 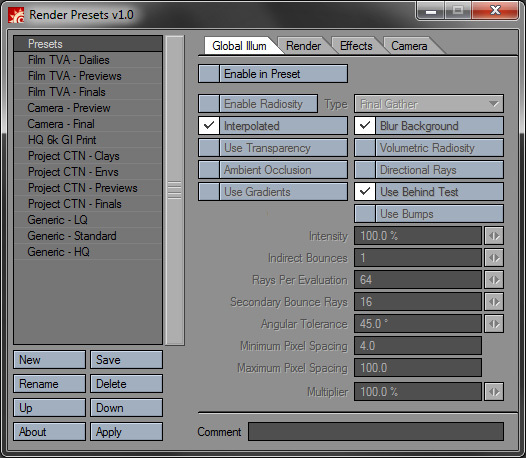 In this release presets can be setup for Global Illumination, Render Flags, Camera Antialiasing, Backdrop and Processing Effects. I might add a few more options in the future when time permits.